Do you have patient’s that snore? Or, patients that have Obstructive Sleep Apnea with difficulty wearing their CPAP? These patients may be candidates for Oral Devices. DynaFlex® offers a number of high quality superior OAT devices for patients that snore or suffer from sleep apnea. For patients that snore or have mild to moderate sleep apnea, oral appliance therapy provides an alternative to the traditional Mask therapy (CPAP). To make it easy for patients to wear an oral appliance, DynaFlex® manufacturers devices in different materials and different designs. The four more commonly requested devices for patients with airway obstruction are the DynaFlex Dorsal®, Herbst, TAP and EMA devices. Click on any of the oral appliances below to learn more about the available options and materials. You and your patients deserve the highest quality materials in a medical device. To assure superior quality standards, DynaFlex® is a United States FDA Registered Medical Device Manufacturing Facility. All our devices are manufactured and shipped from the United States. All the DynaFlex devices have FDA Clearance. In addition, the Herbst and TAP devices are recognized by Medicare and have E0486 code verification for reimbursement. 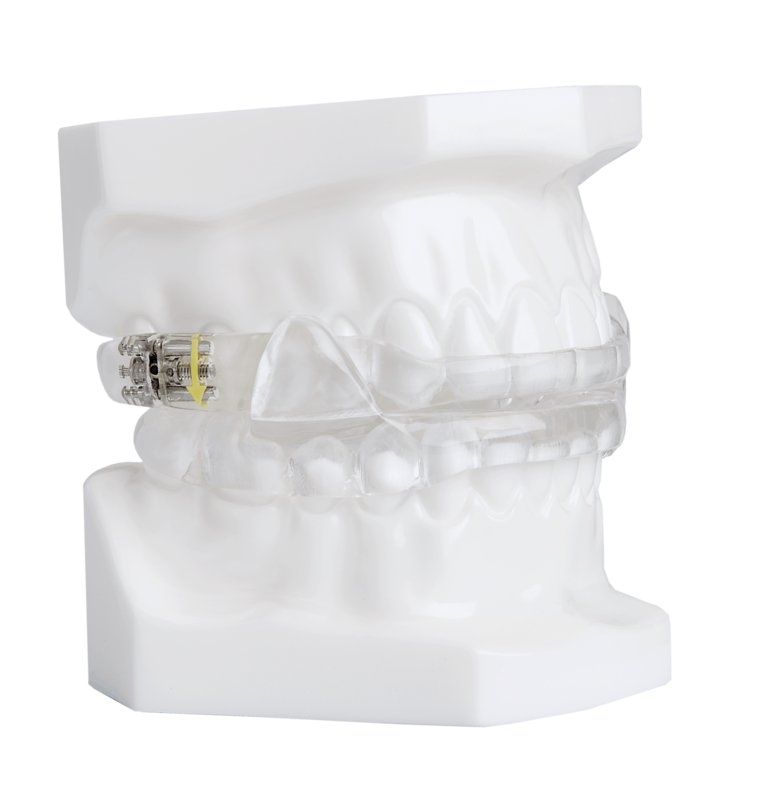 Originally designed as a nighttime TMD splint, the Dorsal Appliance has evolved into one of the most popular choices for snoring and obstructive sleep apnea. The two piece construction allows for patient comfort and lateral jaw movement. The Dorsal fins on the mandibular appliance interface with inclines built into the buccal of the upper appliance to dictate a specific mandibular position. The Adjustable Herbst® is a two piece construction held together with two inseparable hinged mechanisms on the facial of the upper and lower appliances. The hinged mechanisms are designed with advancement screws to allow for titration and advancement of the mandible. The Adjustable Herbst® is designed for incremental advancement of the mandible to the desired position. The two piece Tap® (Thorton Adjustable Position) devices are fully adjustable on a horizontal plane, providing dentists the ability to locate the ideal mandibular position for their patient. The maxillary component utilizes an adjustable screw and hook which interfaces with a lower socket or lower lingual bar to hold the mandible in the desired position. The Elastic Mandibular Advancement (EMA) appliance is the smallest of our obstruction sleep apnea appliances. The individual trays are constructed of 2mm vacuum form material and are held together with straps of varying lengths and flexibility. These straps provide unsurpassed lateral movement and comfort as well as dictating the amount of mandibular advancement. Adjustable Herbst and DynaFlex Dorsal® and includes a 3 Year Warranty.